We are delighted to announce that we will be welcoming Lilian Hardy, Emma Moore and Éva-Marie Saffrey, who will join Abbie Vena as our new Matildas from 14th March. The young performers who will be joining the London company in the three teams playing the roles of Bruce, Lavender, Amanda and the rest of the pupils at Crunchem Hall are as follows: Mylo Burton-Mays, Kira Caple, Jessica Chalmers, Hari Coles, Archie Durrant, Charlotte Fallart, Regan Garcia, Ptolemy Gidney, Aiyana Goodfellow, Sebastian Harry, Angelina Li, Tilda Marriage Massey, Ben Robinson, Tori Louise Ryan and Kacy O’Sullivan. Child cast members Nicholas Antoniou-Tibbitts, Max Brophy, Olivia Calladine-Smith, Elena Cervesi, Miles Harcombe, Michael Hawkins, Sam Jennings, Craig Noakes, Tia Palamathanan and Scarlett Wennink will remain in the company. Performances at the Cambridge Theatre are currently on sale until 17 December 2017. 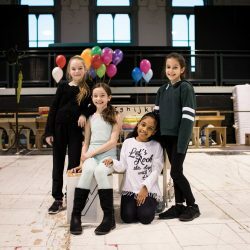 To mark the arrival of the show’s new young actresses, we have released a video of the four girls practising their acrobatic skills and tricks with fellow cast member Craige Els, who plays Miss Trunchbull.